I bought myself a Christmas present this year. The gift was the pasta attachment for my KitchenAid Mixer . And let me tell you, it’s one of the best gifts I have ever gotten. Which isn’t surprising, since I picked it out myself! Making homemade pasta is really easy with the kitchen-aid. It takes about twenty minutes to make plus the “resting time” for the pasta (about 10 minutes). If you don’t have the attachment you can make the pasta by hand. It’s a bit more work but it still tastes amazing! Follow the directions in the manual provided with the ravioli attachment. I watched about ten videos on youtube just to make sure I knew what I was doing. It really helped! 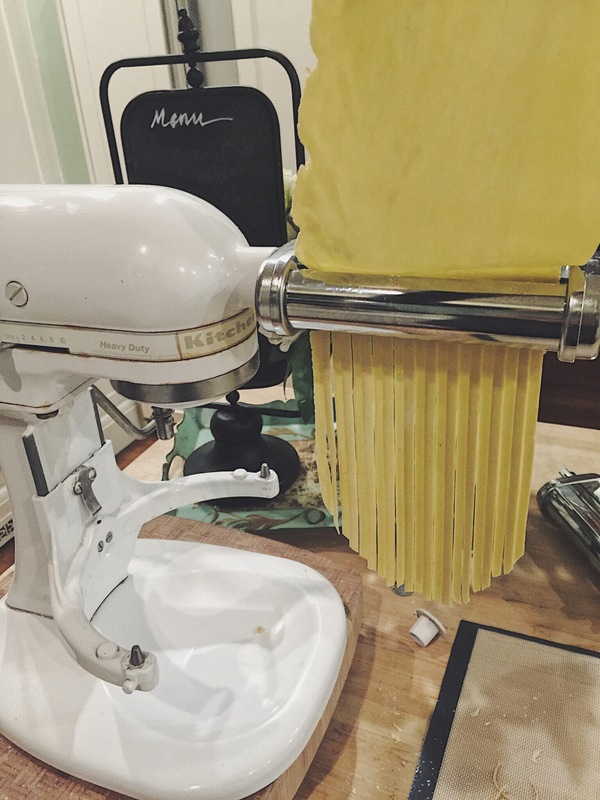 Making homemade pasta is so simple that once you learn how to do it, you'll never go back! Mound the flour on a work surface. Make a well in the center of the flour and add the egg, olive oil and salt. Mix the egg and oil together with a fork and gradually incorporate some of the flour to make a smooth dough. When the dough has formed enough that you can handle it, continue to work in the flour by hand (without the fork). When the dough is sturdy enough roll it through the pasta machine and continue to add flour. When the dough is no longer sticky, stretch it with the pasta machine and cut into the desired shape. In a large saute pan, over medium heat, melt 1 tablespoon of the butter. Add the squash puree and cook until the mixture is slightly dry, about 2 to 3 minutes. Stir in the cream and continue to cook for 2 minutes. Remove from the heat and stir in 3 tablespoons cheese and nutmeg, to taste. 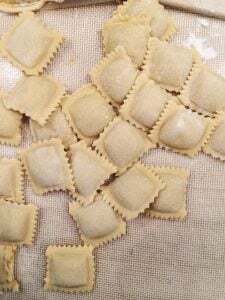 Cut the pasta ribbons into 3-inch squares. Place 2 teaspoons of the filling in the center of each pasta square. Bring 1 corner of the square to the other, forming a triangle and seal the pasta completely. Add the pasta to pot of boiling salted water. Cook until al dente, about 2 to 3 minutes or until the pasta floats and is pale in color. Remove the pasta from the water and drain well. Season the pasta with salt and pepper. In a large saute pan, melt the remaining 8 tablespoons of butter. Add the sage to the butter and continue to cook until the butter starts to brown. Place some of the pasta in the center of each serving plate. Spoon the butter sauce over the pasta. Sprinkle the 2 ounces of cheese over each plate and garnish with parsley. Now I’m curious… what’s your favorite thing to cook?